No doubt that pets are the most innocent and sweet creatures on the earth. Every homeowner loves their pets, but unluckily accidents happen. If you have a pet that piddles in your home, then don’t rush out and buy some expensive cleaning solution. Instead, use one of the pet odor removal methods mentioned below. household remedies that are safe, simple and effective. Note: Before you use any cleaning product on the pet urinate areas, it is best to remove pillow, blankets, slipcovers and other materials. This is essential so you can deep clean the areas separately. Baking soda solutions are the best in neutralizing strong odors and also proven to be harmless for your pets. Just sprinkle the little of baking soda over the area having a funky smell and let it rest for some time. Scrub brush the area so the odor source can be eliminated. After this, vacuum the area thoroughly so that any small particles get a remove. If the pet odor is very irritating and strong, then you can mix the baking soda with water, rub it to the area and let it dry before vacuuming it. It is the myth that using vinegar as a pet odor removal tactic would leave your house smelling like vinegar. Vinegar is used to remove the hard-to-remove pet odor and stains. Use vinegar in a spray bottle and apply it to the offending area. Let it settle for several hours and then use the steam cleaner. Also, you can leave the vinegar until it dries so as it smell fades so will the pet odor. Before applying directly, you can test it on a hidden area of the carpet, ensuring vinegar doesn’t affect the color. As compared to baking soda, cornstarch is also one of the best pet odor removal household remedies. Sprinkle it on the spoiled area, brush it and leave it for 24 hours. If the odor is very frustrating, then spray the area with water until cornstarch becomes wet thoroughly. Let it dry for some time and then vacuum up all the residue to remove all the cornstarch and the odor. For everyday cleaning above mentioned pet odor removal household remedies are the best. But, if you have a tight work schedule and don’t have enough time to clean the then choosing professional pet odor removal service is the smart decision. 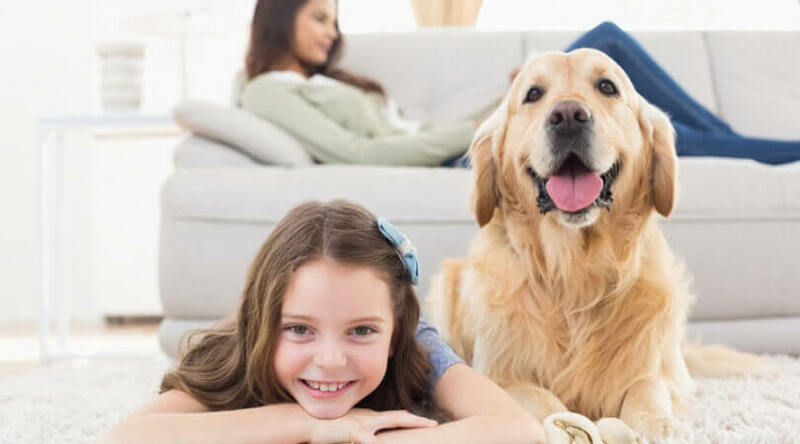 We, at Eco Friend Carpet Care, are the experts in eliminating any kind of pet odor in time and under your budget. Looking for more details about our pet odor removal service? Contact us at 702-768-4900 and get in touch with us. If you want funk in your house, put on a George Clinton album. 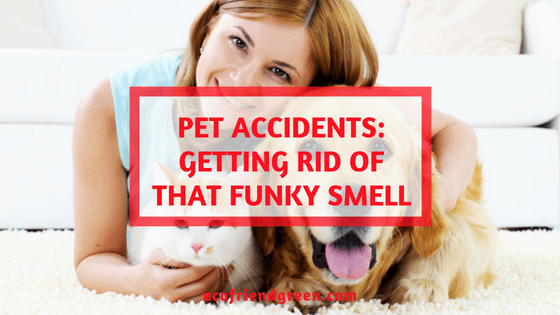 Funky odors coming out of your carpet, however, are not something you want in the house. If something smells bad, the best thing to do is figure out what is causing the stink as quickly as you can. Calling a professional carpet cleaning company to schedule an appointment is the first step. In the meantime, there are a few things; you can do to remove the odor yourself. Just remember, these are temporary solutions. Having a professional clean deep down into the fibers and padding beneath your carpet is the only way to truly remove the mess and the smell that comes with pet accidents. If you have a pet in the house and it has an accident, the quicker you can clean it up, the less likely you are to have a set-in smell later. First, you need to grab some paper towels and soak up as much of it as possible. Blot the area – DO NOT rub it in. Many retailers sell pet urine odor removers and if you have one on hand, this would be a good time to spray some on the area. Follow the directions on the bottle to avoid damaging your carpets. If you find the smelly area after it has had time to dry into the carpet, using baking soda is an option. Sprinkle the powder liberally over the area. You can use a broom to lightly brush the baking soda into the carpet. Let the powder sit at least overnight. If you can stand it, two days delivers the best results. It does take a little while for the baking soda to absorb stuff. If it’s better, but not gone after round 1, you can do another baking soda treatment. Baking soda is generally safe for all carpets…but it does not cure all. Similarly, we said in the beginning, calling in a professional is the best option as they are equipped with all the necessary tools and supplies to handle these things. Eco Friend Carpet Care Las Vegas can get rid of the smells using green cleaning supplies that will not harm your carpet, you or your pets. We cover all of Clarke County. Just let us know what you need and we will be in touch. Call Now (702) 768-4900 for your pet odor removal problems.